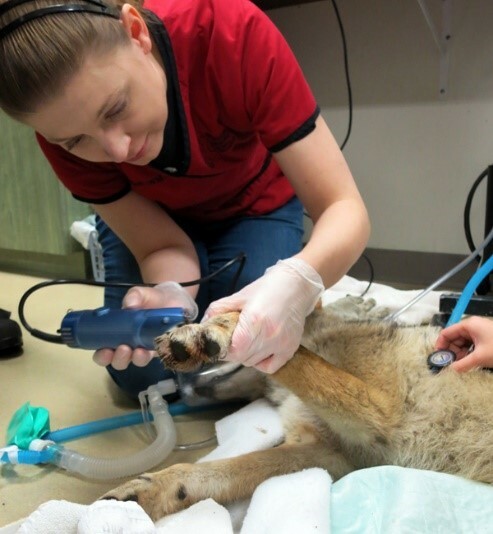 The purpose of the NWRA Wildlife Medicine Course is to provide an opportunity for professional students in accredited veterinary schools to gain formal training in medicine, surgery, and captive management of native wildlife species. The NWRA Wildlife Medicine Course curriculum consists of a two–day (weekend) seminar with both didactic and hands–on training via wet labs. The sponsoring veterinary schools provide supplies needed for the wet labs, and lunch and refreshments for the course attendees. A course manual is provided at no additional cost to the participants. This manual consists of a >400–page compilation of peer–reviewed information provided in electronic format, as well as handouts corresponding to the lecture materials. In order to provide the most practical information possible in just a two–day course, the course emphasis is on care of animals brought to private practices (emergency and/or medical care), with a more general overview of the various aspects of the rehabilitation process. The lectures on the first day of the course place emphasis on the legalities and ethics of wildlife rehabilitation, the role of the veterinarian when working with the rehabilitator, and emergency stabilization of the patient. The lectures on the second day expose the students to specific diseases, diagnostic procedures, and treatment regimens for the wildlife patient. The lab portion of the course provides extensive hands–on opportunities on the first day, and a “self–test” format on day two, allowing students to apply what they see and hear in the lectures that weekend. A certificate of attendance is provided to students upon completion of the course. Click here for a copy of the Annotated Course Agenda. 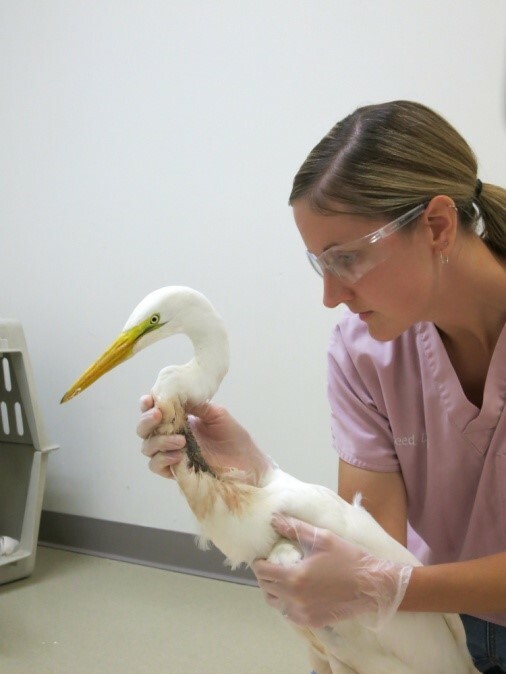 Dr. Rebecca Duerr is the clinical veterinarian and research director at International Bird Rescue's two wildlife clinics in California. She completed her DVM, MPVM, and PhD degrees at University of California Davis, with graduate work on the care of oiled Common Murres and on the nutritional energetics and physiology of Common Murres and Western Grebes. She is just starting (2016) work on co-editing the second edition of Hand-Rearing Birds, co-wrote the wild orphans section of 10th and 11th editions of Merck Veterinary Manual, just finished Seabird Medicine and Orphan Care chapters for a new textbook on wildlife medicine, and is slowly getting all her graduate papers from the intersection of seabird biology and clinical wildlife medicine published. She serves on the Board of Directors of the National Wildlife Rehabilitators Association and is a frequent lecturer at UC Davis on avian physiology and pediatrics. Dr. Purdin is the Director of Veterinary Services at the Lindsay Wildlife Experience in Walnut Creek, California, where the wildlife hospital treats over 5500 patients a year and also provides medical care to their collection of educational animal “ambassadors”. 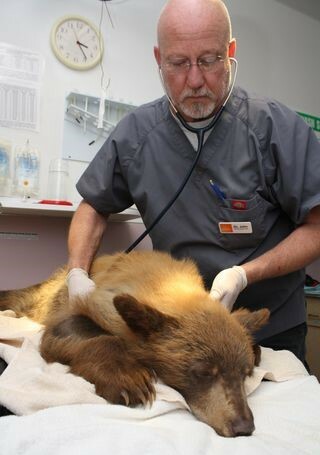 Dr. Purdin began working with wildlife as a volunteer at the Marine Mammal Center where he was active for 18 years. To expand his knowledge of wildlife rehabilitation, he also began working with birds and land mammals at several California wildlife shelters. After making his living as a professional jeweler and then as a movie propmaker in Hollywood, he decided to pursue a full-time career in veterinary medicine and wildlife rehabilitation. He received a BS in Marine Biology from San Francisco State University and his DVM from the University of California, Davis. 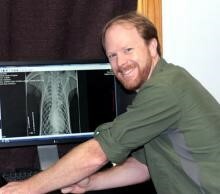 Since graduation, he has provided medical care for a myriad of animal species, both wild and domestic. Previously the shelter veterinarian for the Wildlife Care Association and a member of their board of directors, Dr. Purdin has been with Lindsay Wildlife since March 2013. Dr. Schott is a full-time staff veterinarian at the Wildlife Rehabilitation Center of Minnesota (WRC), one of the largest rehabilitation centers in the country. She has been involved in wildlife rehabilitation for over 13 years and has worked at wildlife rehabilitation centers across the country. Additionally, Renée is involved in teaching courses at the University of Minnesota-College of Veterinary Medicine, does relief work at The Raptor Center in St Paul, is a Course Instructor for the International Wildlife Rehabilitation Council, is the co-chair for the NWRA’s veterinary committee, and lectures across the country on wildlife rehabilitation and medicine. Dr. Reed is a full-time staff veterinarian at the Wildlife Rehabilitation Center of MN (WRCMN). 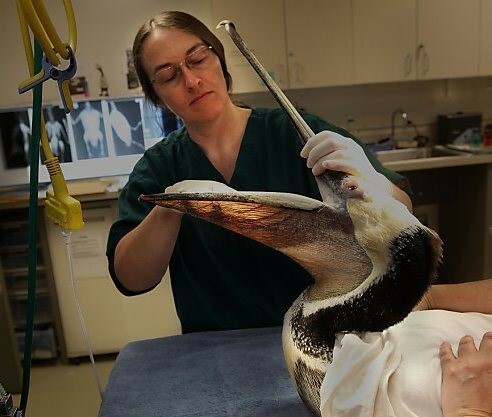 She has been involved in the field of wildlife medicine and rehabilitation for the past 15 years, and has gained experience at many different wildlife hospitals across the country. Leslie is the coordinator of veterinary educational opportunities at the WRCMN, lectures annually in some courses at the U of MN veterinary school and enjoys hosting lectures and labs on a variety of wildlife medicine topics at nearby veterinary schools. Leslie is an active member of the Association of Avian Veterinarians (AAV) and the NWRA veterinary committee. Dr. Karen Alroy received her Doctorate in Veterinary Medicine and Masters in Public Health from Tufts University in 2012. With strong interests in public health and wildlife medicine, Karen has pursued both of these areas throughout her career. As a veterinary student, she conducted externships at the National Aquarium in Baltimore, the Wildlife Health Center at U.C. Davis, and the Southeastern Cooperative for Wildlife Disease Study at University of Georgia. 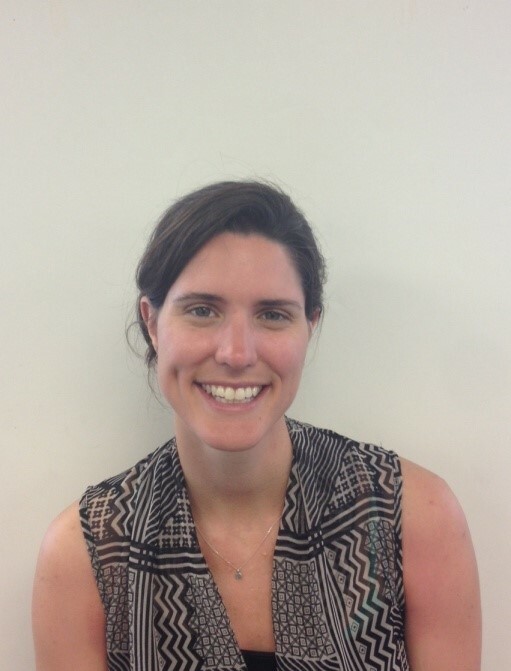 As a Fogarty Scholar with Johns Hopkins University, Karen lived and worked in Peru where she studied the epidemiology of zoonotic diseases, in particular Chagas disease and neurocysticercosis. After finishing vet school, she conducted a small animal emergency medicine internship at Friendship Hospital for Animals in Washington, D.C. While in Washington, Karen was a Science & Technology Policy Fellow with the American Association for the Advancement of Science (AAAS). Through this opportunity she worked at the National Science Foundation, in the Division of Environmental Biology, where she worked on two funding programs: the Dimensions of Biodiversity as well as the Ecology and Evolution of Infectious Diseases. Concurrently, Karen worked as a Staff Wildlife Veterinarian at a rehabilitation center, City Wildlife, for injured and orphaned wildlife in the D.C. metro area. She has taught several seminars both at City Wildlife and regional conferences on wildlife triage and the prevention of zoonotic disease transmission for wildlife rehabbers. Karen now works for the Centers for Disease Control and Prevention (CDC) in Atlanta, Georgia, focusing on global health security. Karen enjoys teaching and being a part of public stewardship of the environment. Dr. Dave is from the small rural community of East Gore, Nova Scotia Canada. He obtained a B.Sc. in biology at Mount Allison University in Sackville, New Brunswick (1999), and then a M.Sc. in ecology and evolutionary biology from Carleton University in Ottawa, Ontario (2001). From 2001-2005, Dr. Dave attended the Atlantic Veterinary College and acquired his veterinary degree. After graduating, he went west to conduct an internship in zoological medicine, exotics, and wildlife at the Western College of Veterinary Medicine in Saskatoon, Saskatchewan (2005-2006). Dr. Dave then traveled east (August 2006) to become the veterinary resident in preventative medicine at the Wildlife Center of Virginia. Dr. Dave became a Diplomat in the American College of Veterinary Preventative Medicine in August 2009. Since 2008, Dr. Dave has served as the Center’s director of veterinary services, where he trains veterinarians and veterinary students in wildlife and conservation medicine. He is responsible for overseeing the teaching hospital, supervising the creation of an innovative software program designed to monitor trends in wildlife health (WILD-ONe), and treats and supervises treatment on native wildlife. Dr. Huckabee holds BS degrees in Zoology and in Veterinary Science and received his DVM from the College of Veterinary Medicine at Texas A&M University in 1985. He has been Staff Wildlife Veterinarian with Progressive Animal Welfare Society’s Wildlife Department in Lynnwood, Washington, since 1998. Prior to moving to the Pacific Northwest he was Director and Staff Veterinarian of the Wildlife Center of Harris County Precinct 4 in southeast Texas from 1991 to 1998. While in Texas, Dr. Huckabee was actively involved on wildlife advisory committees and task forces for Harris County, the City of Houston, the Texas Parks and Wildlife Department, and on the Zoological Medicine Advisory Panel at Texas A&M University. He served on the Advisory Committee of the Pierce College Veterinary Technology Program and the Zoonotic Disease Steering Committing of the Washington Department of Health. Dr. Huckabee served on the Board of Directors of the National Wildlife Rehabilitators Association from 1995 to 2003. Dr. Miller received a BS in Zoology and DVM from Oklahoma State University. Her teaching experience includes a staff position teaching clinical surgery at Oklahoma State University College of Veterinary Medicine, and adjunct faculty positions in Wildlife Medicine at North Carolina State University College of Veterinary Medicine and The University of Pennsylvania School of Veterinary Medicine. 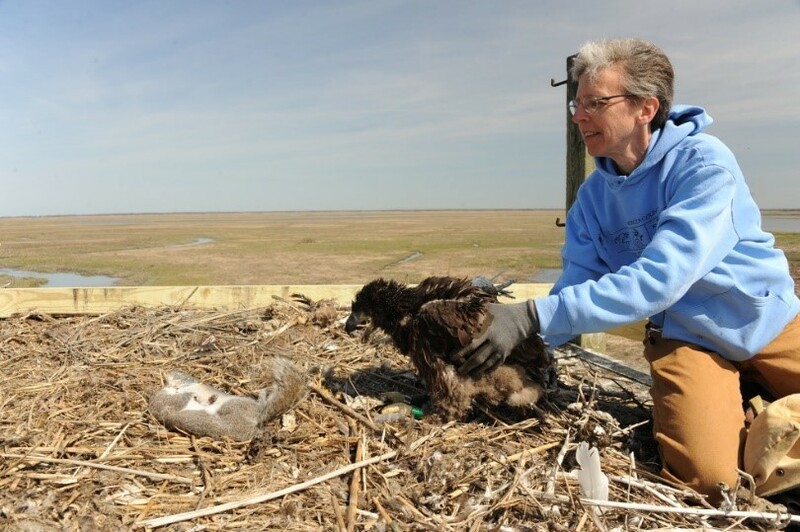 As a wildlife rehabilitator, Dr. Miller was Staff Veterinarian at Willowbrook Wildlife Center in Illinois, Director of Rehabilitation at the Outer Banks Wildlife Shelter in North Carolina, and Oil Spill Response Veterinarian for Tri-State Bird Rescue and Research, Inc. (TSBRR) in Delaware. She is currently the Chief Veterinarian at the Brandywine Zoo, and Wildlife Veterinarian for the NJ Office of Fish and Wildlife Health and Forensics. She serves on the Endangered and Non-game Species Advisory Committee and the Wildlife Rehabilitators Advisory Committee for the state of New Jersey and the Scientific Advisory Committee for the Oiled Wildlife Care Network of California, and is a volunteer on the dissection team for the Smithsonian. Dr. Miller served on the Board of Directors for NWRA for 16 years.